Become a CREW member before December 31st and participate in our most popular Members Only Wine & Cheese Social. This event is in honor of our amazing CREW members and volunteers. Come meet new friends, visit with CREW Trustees and staff, and enjoy some drinks and light snacks under a gorgeous full moon sky. There are many benefits in becoming a CREW member including: reduced member fees for programs, 2 “members only” socials each year, quarterly newsletters to keep you up to date on all of our CREW news, and knowing you make a difference for a small non-profit who continues to preserve and protect the Corkscrew Watershed. 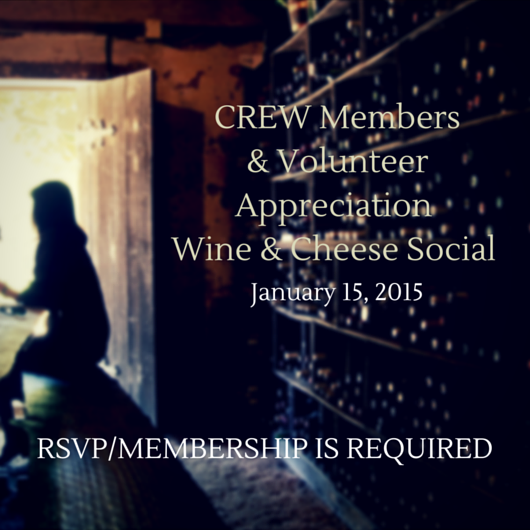 Help CREW continue their mission, become a member, and enjoy wine & cheese under the full moon.